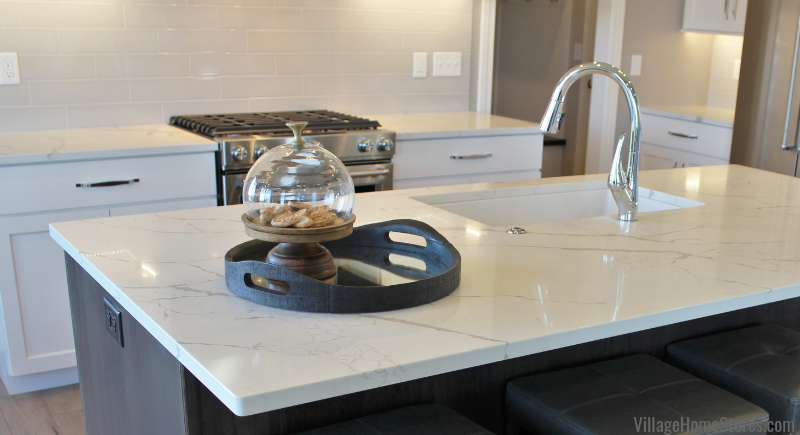 Shown: Calacatta Laza in a Bettendorf, Iowa kitchen. 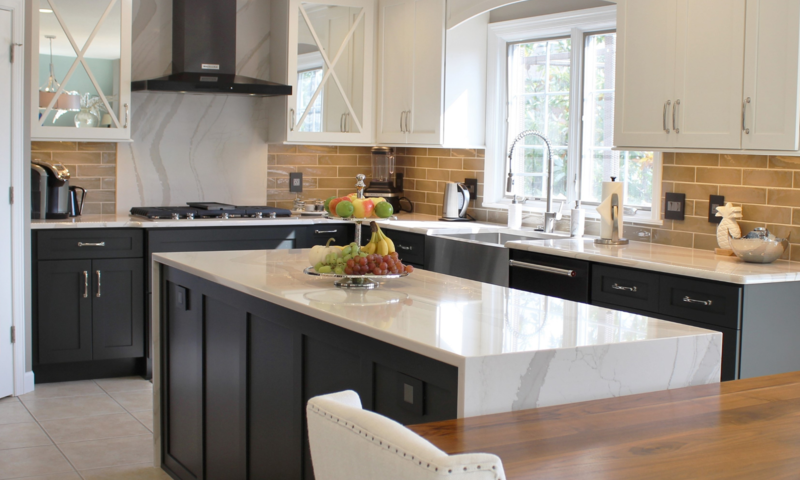 Why Choose Quartz For Countertops? Just because quartz is a man-made product doesn’t mean it isn’t a gorgeous and unique surface for your home! Quartz is a wonderful investment for a countertop in your home that looks great and performs great! It is scratch-resistant, foodsafe, and maintenance free! Because of it’s non-porous characteristics, there is never any sealing required. A non-porous surface also means a foodsafe surface for food prep and service. Many restaurants and commercial bakeries choose to have quartz installed for work surfaces for hygienic and durability reasons. If you have a busy kitchen and truly use your work surfaces, quartz may be the right surface for you! Choose From These 5 Quartz Tops at Just $59 /sq.ft. Installed! For just $59 /sq.ft. you can have any of these colors installed in your home! Choose from Peppercorn White, Fossil Gray, Bedrock, Carrara Marmi, or Alpine. Of course we would love to see new counters AND cabinetry in your home from Village Home Stores. So if you select one of the above colors and purchase the cabinetry for your project from us we will install your quartz at just $56 / sq.ft. Choose From These 5 Quartz Tops at Just $69 /sq.ft. Installed! For just $69 /sq.ft. you can have any of these colors installed in your home! Choose from Chantilly Taupe, Gray Lagoon, Calacatta Vicenza, Babylon Gray, or Carrara Caldia. Of course we would love to see new counters AND cabinetry in your home from Village Home Stores. So if you select one of the above colors and purchase the cabinetry for your project from us we will install your quartz at just $66 / sq.ft. Choose From These 5 Quartz Tops at Just $79 /sq.ft. Installed! For just $79 /sq.ft. you can have any of these colors installed in your home! Choose from Calacatta Laza, Fantasy Gray, Pelican White, Rolling Fog, or Portico Cream. 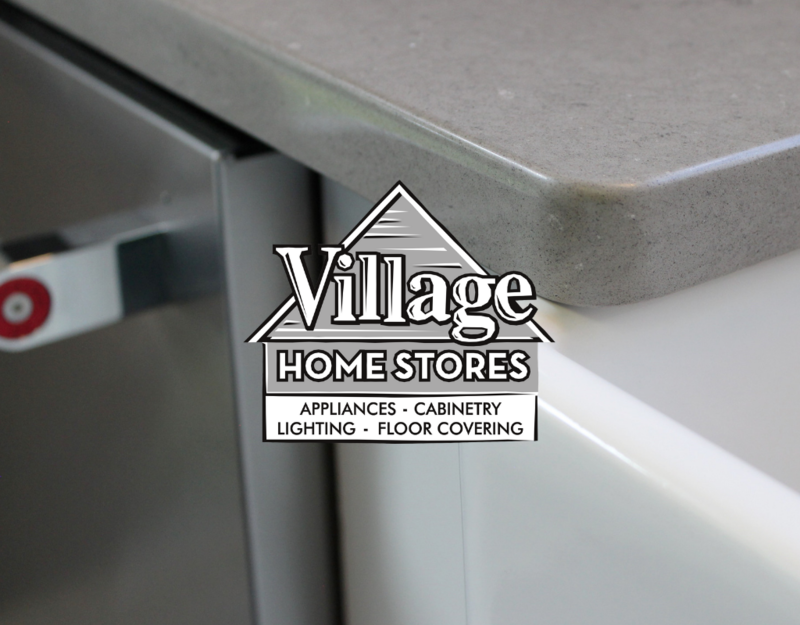 Of course we would love to see new counters AND cabinetry in your home from Village Home Stores. So if you select one of the above colors and purchase the cabinetry for your project from us we will install your quartz at just $75 / sq.ft. Please note that while there are three levels of pricing for our promo quartz colors, they are all the same great quality. The pricing is based upon design series and product availability, not durability. Our Village Home Stores kitchen and bath experts can help you select the right design for your overall concept. What’s Included in a sq/ft Price For Quartz Tops? Your sq/ft price from Village Home Stores includes template, fabrication, and installation of your tops. There will be no added installation charge, this is an installed price and includes a template to confirm correct dimensions for your countertops. A standard undermount sink opening and faucet drilling are also included. 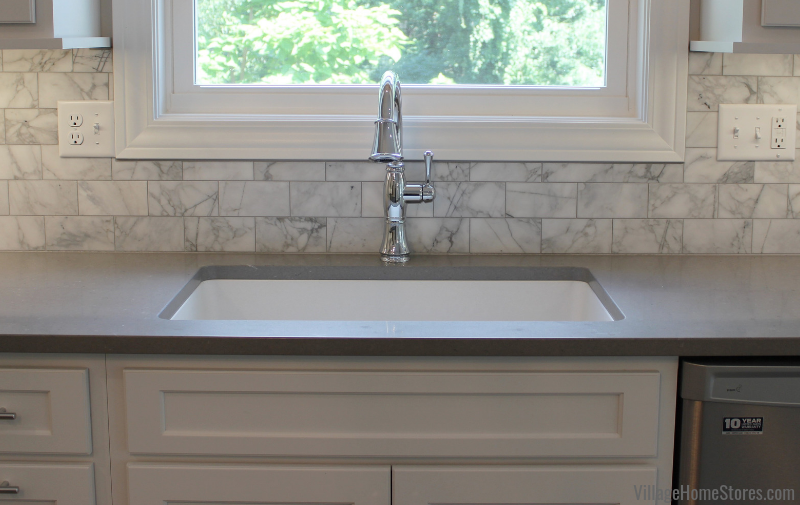 Undermount sinks are recommended for quartz countertop installations because they give you a clean look that is easy to wipe clean from surface to the sink. Undermount sinks come in a variety of materials and design. 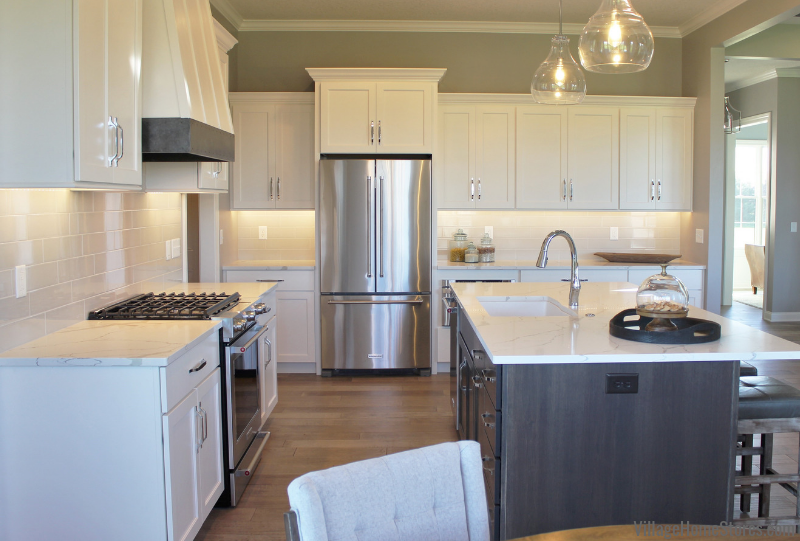 For kitchen sink inspiration check out this ideabook we made on our Houzz page. 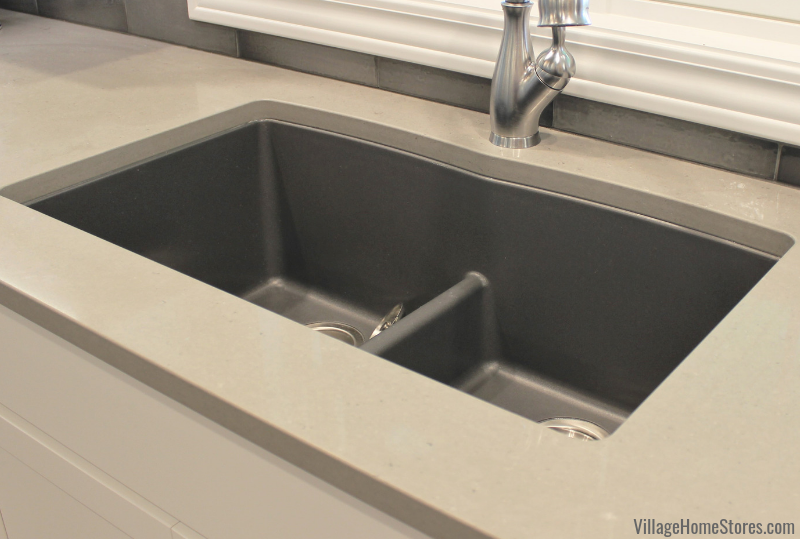 Your salesperson at Village Home Stores will partner with our Quartz fabrication shop to communicate the sink model and faucet locations you have selected so that they can install your purchased sink to the tops at installation. Shown: Fossil Gray in a Moline, IL kitchen. What Isn’t Included in The Price? Cooktops, slide-in ranges, additional sinks, additional faucet holes, and outlet cut-outs available at an upcharge. This installed price does not include plumbing hook-up of sink or faucets. You must provide a drawing with measurements and a layout for a quote. All we need are a few basic measurements from you to quote you a price for your counters. Don’t worry, this is NOT what is used to fabricate your countertops. It is just enough information to answer our questions and get you an accurate sq.ft. quote for your space. While this is an installed price, the removal of your existing tops must be arranged before template and installation dates. This can be quoted to you upon request. Existing countertops must be removed before template date. 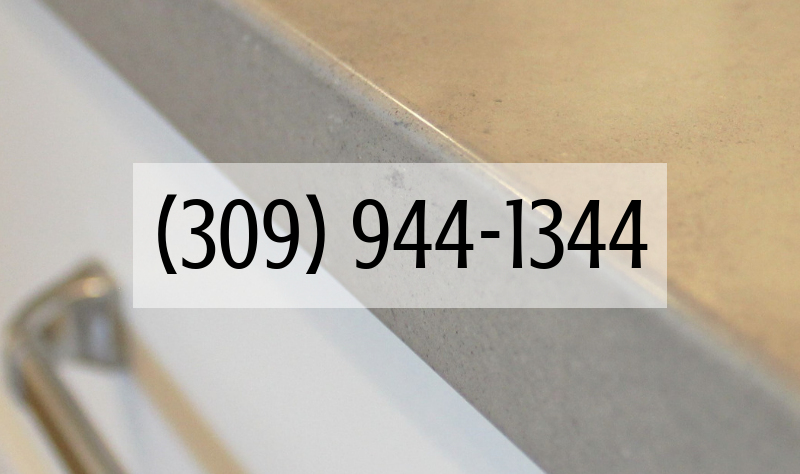 Once your template date has been arranged, you can expect just a one week turnaround time for your countertops! While we understand that being without countertops and a sink is an inconvenience, we have worked hard to narrow this timeframe down to a single week to help. Check out this past blog post about setting up a temporary kitchen and dishwashing station while you are waiting for your project to be completed. If it is determined that an overhanging area of quartz surface requires support brackets, they can be quoted to you for an additional charge. We have many quartz countertop surfaces installed in our showroom displays as well as samples of each of these promo-priced options. Are you interested in getting a quote for one of these stunning quartz surfaces for your own home? Just reach out to our kitchen design team for a quote. You can call us at 309 944 1344 or complete this short online form and a team member will contact you about your project. We can’t wait to hear what project you are working on!